The health benefits of Echinacea are commonly utilised in Winter to strengthen the body’s immune system. Known for its strong cold and flu preventative powers, the Echinacea plant is used in many countries as a root and herb tincture. Gardeners of classic perennials know Echinacea, or the coneflower, as a butterfly and bee attractant and graceful addition to their flower beds. A nice tea can be made from the leaves and flower petals and some of its many medicinal qualities can be extracted this way. However, to receive full benefit from its twelve powerful immunostimulant and eighteen anti-viral phytochemicals this plant contains, a tincture made from the leaves is more potent and certainly will provide anti-cold and anti-flu protection to the utmost level. It can also be used as an anti-allergic agent for its five chemicals that protect against allergies. Take only for three weeks, then stop taking for two weeks. Do not give to children under two years of age or to anyone who has asthma. Do not take if you have an auto-immune disorder. Finely chop up the leaves and place in a salad or in soups or use the leaves in teas, infusions and to make tinctures or glycerines. Echinacea plants, Echinacea angustifolia or E. purpurea, prefer some shade and don’t like being hot and dry. It can be grown by dividing existing clumps in Spring or Autumn, or from seed. If growing Echinacea from seed, soak the seeds in cold water and chill in the fridge for 2-3 weeks before planting in Spring. Echinacea can be sown direct in Autumn in areas prone to frost. We do not diagnose or prescribe, and we strongly urge you to see your healthcare professional if you are suffering from any condition or chronic illness. Herbs can be dangerous if not identified or used correctly. Herbs do not replace advice or treatment from your healthcare professional. Please read this important caution regarding the safe use of herbs. 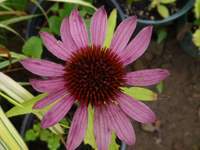 Echinacea’s phytochemicals and phytochemical properties are selectively cited by the author from the Dr. Duke's Phytochemical and Ethnobotanical Databases, http://www.ars-grin.gov/duke/plants.html, Jim Duke and Mary Jo Bogenschutz.